A Claddagh Ring with Birthstone. The iconic Irish Claddagh ring meaning and history has birthed one of Ireland’s most legendary trinkets. A powerful symbol of love, loyalty and friendship, this promise ring is the true hallmark of traditional Irish values that touch the heart of all cultures. Wearers will be happy to know that the unique and timeless appeal of this ring is authenticated by an illustrious heritage. Celtic folklore suggests that the legend of the Irish Claddagh ring emanates from regal 17th century Galway. Played out against the backdrop of the joint reign of King William III and Queen Mary II, a story of love triumphing over adversity permeates the history of the Claddagh ring and dazzles its wearers to this day. Master goldsmith and Claddagh Village native Richard Joyce is reputed to have fashioned this stunning treasure whilst being held captive by Moorish pirates in the West Indies. Joyce’s captor proceeded to teach him the craft of ring making. During his many years of imprisonment, Joyce focused on producing his most famous design for his sweetheart, who was waiting patiently for his return to the Emerald Isle. The ring he chose to create for her was based on the ancient Roman “fede” ring, which is a type of promise ring or heart ring given to loved ones as a token of affection. At the behest of King William III, Joyce was eventually freed, returning home to Galway with the ring he had so painstakingly crafted in captivity. In celebration of the strength of their love, which had clearly stood the test of time, Joyce gave his greatest masterpiece to his sweetheart. The ring was considered to be the ultimate pledge of his commitment to her, signifying his intent to honour their relationship with marriage. Their eventual marriage was so prosperous that it became a reflection of the monarchical union of King William III and Queen Mary II. Good fortune and divine protection are elements that are thought to surround wearers of the Claddagh to this day. There are many ways to wear the 21st-century version of the Claddagh. If you are trying to work out how to wear a Claddagh ring, then bear in mind that each style is emblematic of the wearer’s status in his or her relationship with the ring-giver. Lets look deeper into the Irish Claddagh ring meaning and symbolism. The Galway Claddagh is made from precious metals that have been sculpted to represent a pair of hands clasping a heart encased by a crown. The hands symbolise friendship and togetherness, the heart represents love, and the crown denotes loyalty. The traditional heart ring is often worn as an engagement ring or wedding ring, and it has also recently become popular as a Valentine’s Day gift. It can also be worn more casually as an alluring piece of fashion jewellery. Whether you wish to suffuse the ring with romantic sentiment or display it for high fashion purposes, learning how to wear it will ensure you fully understand the etiquette surrounding the ring. This will enable you to make a suitable impression on those already part of the “Claddagh club”. If your heart has been captured by someone special, you can convey this to admirers by wearing the ring on your right hand ring finger with the heart’s point facing inward towards your heart. If your heart is available and you wish to indicate that you are searching for love, wear it on your right hand ring finger with the heart’s point facing outward. Alternatively, by placing the ring on the left hand ring finger with the heart facing outward, you can show that you are engaged. A ring placed on the left hand ring finger with the heart facing inward will demonstrate that you are married. The Galway Claddagh ring is made from the highest quality gold, silver and platinum. Nowadays, the heart ring is often adorned with the recipient’s birthstone or diamonds to add an extra touch of luxury and sophistication. In accordance with the Irish law of 1637, the Claddagh promise ring must be stamped with an official hallmark to guarantee its fineness and purity. This traditional hallmark originates from the official insignia of the seat of the Irish Government based at the Irish Assay Office in Dublin Castle. The symbol used on the ring is the traditional letter symbol for the year in which the ring was crafted. 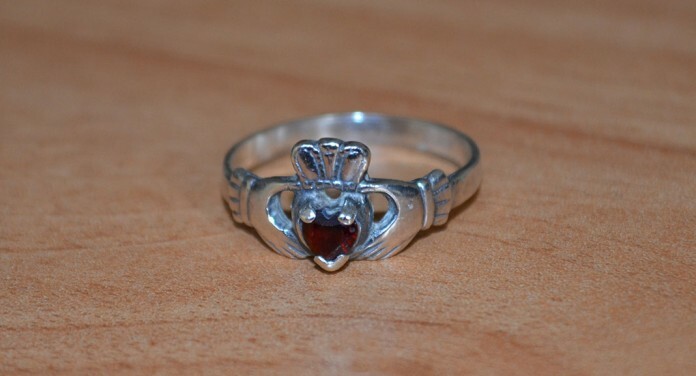 By purchasing an iconic Claddagh, you can be certain that your investment will bring the chance of a fortuitous return. It will definitely enrich the life of your friend or loved one with the spirit of traditional Irish culture. A heart ring such as this will ultimately guarantee you a share in preserving ancient Claddagh promise ring symbolism. If the Claddagh ring is calling to you, make a wise choice and listen. In Love and Friendship we Reign.